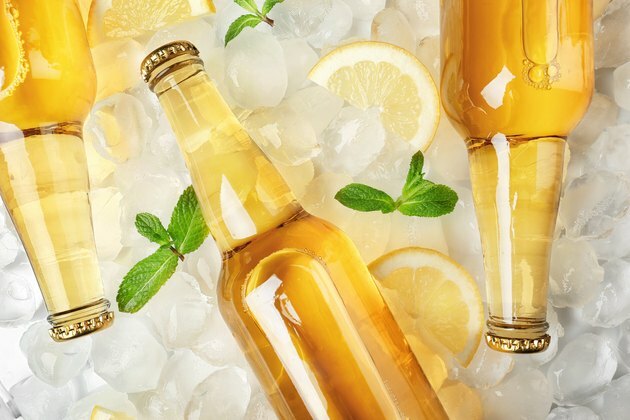 If you've ever sipped a cold Mike's Hard Lemonade on a hot day, chances are you've scanned the bottle for a nutrition label to see where that good taste is coming from and how many calories to log into your food journal. Because the malted beverage is technically classified as beer, the company isn't obligated to put ingredients or any nutrition labeling on the bottles. With closely guarded proprietary ingredients and formulas, the company chooses not to reveal what's in Mike's Hard Lemonade. As mentioned above, there are 228 calories in an 11-ounce bottle of "hard lemonade malt beer alcoholic beverage" according to the USDA's National Nutrient Database. The USDA doesn't mention any names, but Nutritionix does, estimating the caloric content of Mike's at 220. The light version of the product delivers much less, about 100 calories. The original version of the product has 33 carbs, 32 of which stem from sugar content. Go light, and you're looking at just 4 grams of carbs and sugars, something you might want to consider if you're on a keto or other low-carb, low-sugar diet. Beware of going "Harder," though. Mike's Harder Black Cherry Flavor delivers a whopping 400 calories stuffed into that 11-ounce bottle, along with 46 grams of sugar. If that's the flavor you're craving, consider the flavor's lighter harder version, which steps you back to 150 calories with 13 grams of sugar and 15 carbs. Read more: How Many Calories Are in Vodka and Lemonade? So what's in Mike's Hard Lemonade? Even though Mike's Hard Lemonade keeps its ingredient list a proprietary secret, they're happy to roll out a list of things it doesn't contain for those concerned with allergens or gluten. The product doesn't have any of the most common allergens found in the food and beverage industry. Mike's specifies that its product is free from wheat, rye and oats that are sometimes used as brewing grains, as well as soy, peanuts, nuts and eggs. You'll also probably be relieved to know that other allergens, including fish, shrimp and other shellfish, <ahref="https: www.mikesharder.com="" faq="" nutritional-info="" "=""> </ahref="https:>aren't lurking anywhere in that cool yellow beverage. The product begins with malt grains fermented with yeast. In much of the brewing industry, malt grains derive from barley, but they could also source from other grains such as wheat, rice or maize. Once the grains are converted to alcohol and filtered to remove gluten and any impurities, lemon juice, lemon zest and natural sugars get added to the mix. Mike's has flavors ranging from watermelon, mango and peach to various berry flavors and more. Each flavor derives from natural fruits, according to the Mike's website. You can contact the company and ask about a particular ingredient that you're concerned about — for example if you have wheat or corn allergies — and they'll be happy to tell you if you have anything to worry about when sipping a cold one. Mike's cautions that: "Mike's is hard. So is prison. Don't drive drunk." The regular beverages contain 5 percent alcohol by content, and the harder flavors have 8 percent. Keep alcohol from hitting your bloodstream all at once when you eat while you're drinking, but beware — alcohol can fire up neurons in your brain that tell you that your body is starving, increasing the odds of blowing your diet. Northern Brewer: Grain Guide; What is a Malt?